On March 4, 2014, Starbucks launched it’s newest Macchiato drink, the Vanilla Macchiato, adding to an already popular series of macchiato drinks, which includes Hazelnut and the original Caramel Macchiato. What makes a macchiato different from any ordinary latte is how it is “marked” with a shot of espresso (or 2 shots for a grande and venti) on top of the velvety foamed milk. This adds a stronger and richer coffee flavor than an ordinary latte, where the shots sit at the bottom of the cup. What makes the Vanilla Macchiato unique is that the base syrup is vanilla, and… drumroll please… it is topped with a Madagascar Bourbon Vanilla ribbon on top of the luscious milk and rich espresso shots. My Opinion: As a former Starbucks Barista, I loved making macchiatos. What most people don’t know, and probably could care less about, is that to make the perfect macchiato, you have to pull the shots separately and then pour them over the foamed milk IMMEDIATELY, lest the shots turn black and you are left with one seriously bitter cup of coffee. I loved the Vanilla Macchiato. It is less sweet than its predecessors and really packs a punch because the Madagascar Bourbon Vanilla drizzle (that by the way does not have bourbon in it) is mildly sweet with a bit of a woody or even spicy flavor. Therefore, if you like really sweet coffees, this is not for you. But if you like vanilla lattes, this may be for you. And if you love the taste and aroma of strong coffee and the warm feeling of vanilla coating your pallet, then this is DEFINITELY for you. Tips for Ordering a Vanilla Macchiato:If you normally get your lattes nonfat (as I do), you may want to reconsider this time. 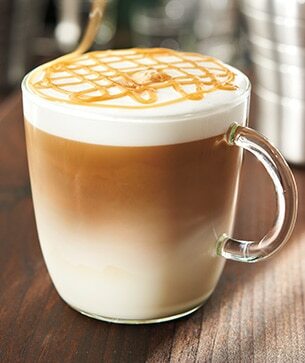 The combination of the vanilla syrup, the drizzle and the espresso shots on top makes this latte beg for a little sweetness. I have no advice for soy milk drinkers except that I would assume that because they use a vanilla soy that is full fat, you probably won’t run into any “sweetness” issues. Secondly, if you normally modify your drinks with less syrups, again you may not want to do that. The first time I did that, the drink was very bland. The second time I ordered it with no modifications except that it be extra hot (I had to be a coffee snob) and it tasted much fuller and much bolder. Finally, if you want to pair this new masterpiece with a pastry, I would suggest the lemon loaf from Starbucks’ new(ish) La Boulange line of pastries and desserts. The tanginess pairs well with the brown sugar and spice in the Madagascar Bourbon Vanilla drizzle and lessens a bit of the intensity of the espresso shots. So, that’s all folks… And no, I do not do PR for Starbucks. I just think it’s fun to critique coffee as a self-proclaimed coffee connoisseur.